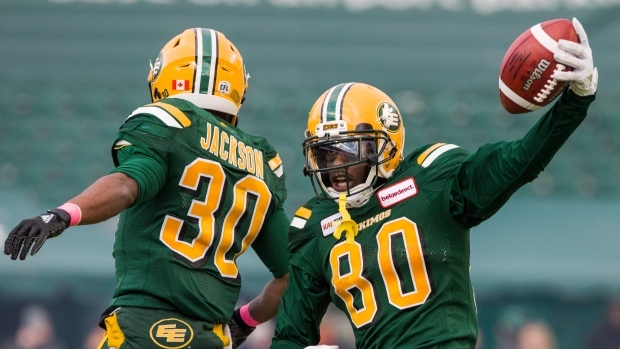 EDMONTON — The Edmonton Eskimos regained their focus before it was too late. CJ Gable ran in a pair of touchdowns as the Eskimos kept themselves in the playoff picture with a 34-16 victory over the Ottawa Redblacks on Saturday. The Eskimos snapped a three-game losing skid to improve to 8-8 and to remain in contention for a playoff spot through both the West and East Division paths. "When you don't win for a while and people are doubting you and you are not playing up to your abilities, it starts to distract you," said Eskimos head coach Jason Maas. "They were ready to go today and obviously the sacrificing we have done, it feels like it paid off in this moment and we were able to feel good again." Despite missing the walk-through with the flu on Friday, Eskimos quarterback Mike Reilly was impressive, completing 31-of-38 passes for 369 yards while rushing the ball for 72 yards. "More than anything, we just needed a win to get back on track," he said. "I thought it was a solid game in all three phases, offence, defence and special teams just getting back to playing our kind of football." The Redblacks (8-7) have lost two straight, but remain in a tie in points for first place in the East with Hamilton. "We played one winning half of football, but you obviously have to play two halves to get it done and we didn't. They beat us in the second half, that's for sure," said Ottawa head coach Rick Campbell. "We have three games left and if we win two then we get first place. That is not an awful situation to be in." Ottawa scored on its opening drive, getting a 32-yard field goal from rookie Lewis Ward, his CFL record-extending 41st consecutive successful three-pointer. Edmonton finally got a touchdown after going nine quarters without one, a drought of 152 minutes and 21 seconds, when Martese Jackson ran 13 yards into the end zone with three minutes left in the opening quarter. The Redblacks responded with another Ward field goal to start the second, and then got another one midway through the quarter to take a 9-7 lead. Ottawa added to that with a huge 61-yard passing touchdown from quarterback Trevor Harris to Diontae Spencer. The Eskimos closed back to within two with 29 seconds left in the first half when Gable ran one in from three yards out. Edmonton inched ahead with a 15-yard Sean Whyte field goal to start the third. Reilly engineered another solid drive on the Eskimos' next possession, with Gable scoring a four-yard rushing TD. Whyte added another field goal to start the fourth to put Edmonton up 27-16. The Eskimos got some insurance midway through the fourth when Reilly took a big hit in order to complete a pass to Bryant Mitchell, who went 75 yards for the TD. "He was possessed today," Maas said of Reilly. "He knew how important this game was for our team." Both teams are back in action next Friday. The Redblacks host Hamilton and the Eskimos are in Vancouver to play the B.C. Lions. Notes: The Redblacks won the previous meeting between the two teams 28-15 in Ottawa on Sept. 22, the last game in which the Eskimos had scored a touchdown… The Eskimos came into the match-up having not been able to score a single point in the fourth quarter of their last four games and had given up nine sacks in their last two contests, but had 10 points in the fourth and gave up no sacks on Saturday.